Petroleum hydrocarbons have been measured at depths of meters in permafrost (Biggar et al. 1998; McCarthy et al. 2004) even though petroleum migration into permafrost should typically be minimal, due to high pore-ice saturations in the upper few meters of these frozen soils. Presence of petroleum hydrocarbons in both these cases was attributed to free-phase petroleum movement through interconnected air voids in the frozen soil. These air voids may result from unsaturated compacted soil, fissures resulting from thermal contraction, or naturally occurring air voids in granular material (such as beach deposits) due to natural processes. Frozen fine soils can contain unfrozen water at the soil surface boundary. 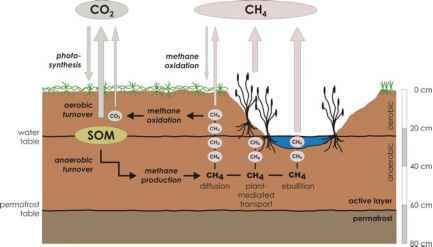 Lacking pathways for petroleum to flow advectively into ice-rich permafrost, a possible transport mechanism is diffusion of petroleum hydrocarbons through the unfrozen water content. Aqueous phase diffusion is a relatively slow transport process in comparison to advection. The contribution this transport mechanism makes to moving contaminants into permafrost soils is most likely minimal. The role of diffusion in the movement of petroleum hydrocarbons into permafrost can be shown with a simple example. Consider the following solution to Fick's Second Law, with a constant concentration of a dissolved petroleum hydrocarbon at the top of a deep layer of permafrost that does not contain the petroleum hydrocarbon initially. In (5), Cw(z,t) is the dissolved phase concentration of the petroleum hydrocarbon in the unfrozen soil-water as a function of time and space, Cwo is the dissolved phase petroleum hydrocarbon concentration in the soil-water at the top of the permafrost, z is the depth into the permafrost from the top of permafrost, a is the effective diffusion coefficient divided by the retardation coefficient, and erfc is the complementary error function. For this example, assume that a release of petroleum has occurred in a permafrost region and that the water-saturated zone in the active layer above the permafrost contains benzene at a concentration that is equivalent to the product of the z compounds solubility and its mass fraction in the released petroleum. The retardation coefficient for benzene in this scenario is 8.55. The temperature of the permafrost is -3°C and the soil is comprised of Fairbanks Silt. From Tice et al. (1976) the unfrozen volumetric water content can be estimated to be 0.062. Assuming the soil to be ice-saturated in the region just below the top of permafrost, the porosity available for diffusion is equivalent to the volumetric unfrozen water content. The resulting effective diffusion coefficient is 2.6 x 10-11 m2 s-1. With these reasonable assumptions and considering diffusion as the only transport mechanism, after 10 years the concentration of benzene at a depth of 0.1 m into the permafrost from the top of the permafrost is only 2.2% of the initial concentration. Hence, under the conditions of this example, which are reasonable, movement of petroleum hydrocarbons into permafrost by diffusion is much too slow to be of concern.